Debi (on the gate), and Ted. It’s hard to recall which you’d noticed first about meeting Willy Chamberlin — his big, easygoing smile or his really big, shiny belt buckle. His smile was genuine and always the same — the natural smile of a man who knows who he is and where he’s from. A scion of a pioneer California family, Willy grew up on a ranch north of Los Olivos, dotted with valley oaks, polled Herefords, and grasshopper wells pumping heavy oil from fractured Monterey shale. Willy’s belt buckles were rarely the same because he had so many of them, championship prizes won at team penning competitions from Santa Barbara’s Fiesta Rodeo to San Francisco’s Cow Palace. 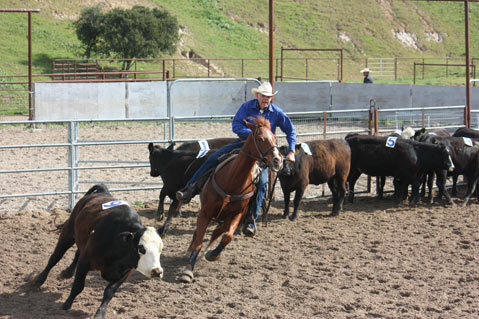 Team penning, like Willy, dates back to the early 1940s. It features 30 yearlings in trios sporting a number 0 to 9 on its back. Each team has three riders who have 90 seconds to identify their three numbered cattle, separate them, and herd them into a small pen at the far end of the arena. The team with the fastest time wins, and winners take home large, shiny belt buckles. The fast-paced sport requires good horsemanship as well as teamwork, precision, strategic planning, a good eye, and quick thinking. Willy understood teamwork and strategic planning in business as well as on horseback. For 50 years he served on the board of his family’s Bixby Land Company, a Southern California–based real estate firm dating from 1853, back to Willy’s great-grandfather Lllewellyn Bixby. Along with cousins Thomas and Benjamin Flint, Bixby had driven 2,400 sheep overland to California in 1853 and ’54, creating the Flint, Bixby & Co. partnership. The next year, they partnered with W.W. Hollister, and through the 1860s they purchased Rancho San Justo in San Benito County, as well as Rancho Los Cerritos and portions of ranchos Los Alamitos, Lomas de Santiago, and Palos Verdes. More than 20,000 head of Bixby sheep were pastured over a vast area now comprising Long Beach, southeastern Los Angeles County, and western Orange County. Flint, Bixby & Co. expanded into the Coast Line Stage Company in the late 1860s and 1870s. Their six-horse-team stagecoaches carried passengers and mail between San Jose and San Diego along the new Santa Ynez Turnpike Road over San Marcos Pass, saving 25 miles over the former coast route through Gaviota. In 1896, Flint, Bixby & Co. was dissolved and the Bixby Land Company established by the Southern California branch of the expanding Flint/Bixby family. Willy was born on the Fourth of July in 1940, raised on Rancho Los Potreros with his older brother, Fred, and sisters, Helen, Debi, and Sarah. At age 5, Willy began his lifetime of ranch work — mending fence, sorting calves, stacking wood, bucking and hauling hay, and irrigating pastures. While in elementary school, Willy and Fred — at the insistence of their mother, Ailie — bought suits to wear to the Cattlemen’s Association convention in Santa Barbara. Projects through 4-H followed in time, along with exhibiting polled Herefords at the County Fair. As a teenager Willy was already a leader, president of his high school class in Santa Ynez. After studying business at Claremont College and two years in the army, Willy returned to Rancho Los Potreros. In the late 1960s, he was chosen for the second class trained at the prestigious California Agricultural Leadership Foundation. His formal leadership training complemented his big smile, and he began a life of community service, including the Cattlemen’s Association, Santa Ynez Valley Airport Authority, Fiesta Rodeo (chairman, of course, for team penning), Los Olivos and Midland schools, the county’s Agricultural and Agricultural Preserve Advisory committees, Rancheros Visitadores, Santa Barbara Trail Riders, and the Society of Los Alamos. Chamberlin at a 2011 teampenning event. The same keen eye that helped Willy cut yearlings in the rodeo arena turned to politics when he decided to take on Bill Wallace, a Goleta veterinarian and the incumbent 3rd District county supervisor. Wallace was a proponent of active government and slow growth, popular in the South County. Willy’s North County background was in agriculture and business; he often said he relied on “cowboy logic.” Their north-versus-south, rural-versus-urban, ideological contest in November 1992 was the closest such election in county history. Feelings ran high on both sides. The county elections office announced Willy the winner by seven votes. Wallace paid for a recount, which reduced Willy’s winning margin to five votes. When Willy took the oath of office in January 1993, he broke the longstanding grip the South County had held on the board’s majority. Distressed over the loss of control, on May 7, 1993, Wallace challenged the county’s vote counters in Superior Court, arguing that some Isla Vista voters’ ballots were not counted after poll workers let them vote in the wrong precinct. The trial judge again reduced Willy’s winning margin — this time to only two votes. Wallace then went to the Ventura Court of Appeals. On April 20, 1994, that court, on a two-to-one decision, declared Wallace the winner by 12 votes. 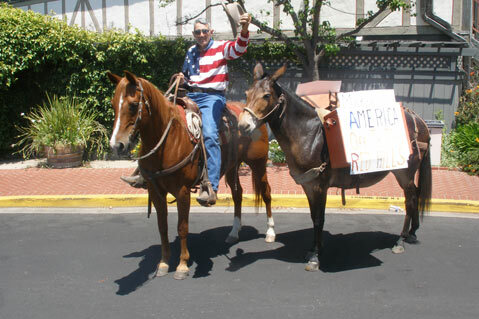 <b>FAREWELL, WILLY:</b> Former county supervisor Willy Chamberlin loved being in parades, and at left he celebrated his 70th Fourth of July birthday in Solvang. Disappointed by the two votes from the appellate justices that overturned his former two-vote victory proclaimed by the trial court, Willy appealed to the California Supreme Court. That court ended his tenure on the Board of Supervisors by denying Willy’s petition on July 28, 1994. Precisely 21 years later, on July 28, 2015, Willy died at Rancho Los Potreros at age 75, survived by two children, Ann and Russell, and two grandchildren, Olivia and Layne. His daughter Beth predeceased him in 2004. 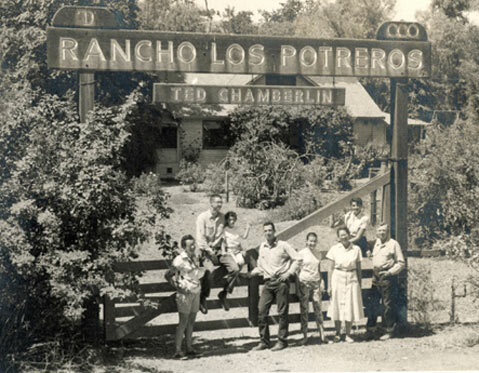 A tribute to Willy Chamberlin will be held at Rancho Los Potreros on Figueroa Mountain Road on Saturday, August 29, at 3:30 p.m.